A number of data values in the transmittance channel exceed 100%. It is believed such values occurred due to lenses on the transmissometer being fouled by an oil film. All values where transmittance exceeds 100% have been automatically flagged by the screening software used. This air reading was 0.34 V lower than the previous calibration and bench test and this was believed to be as a result of the fouling of the lenses. These later readings were nearly identical to the previous calibration and bench test results. Despite data appearing to be more reasonable from cast 48 onwards, however, caution should be exercised when using these data considering the problems experienced earlier in the cruise. 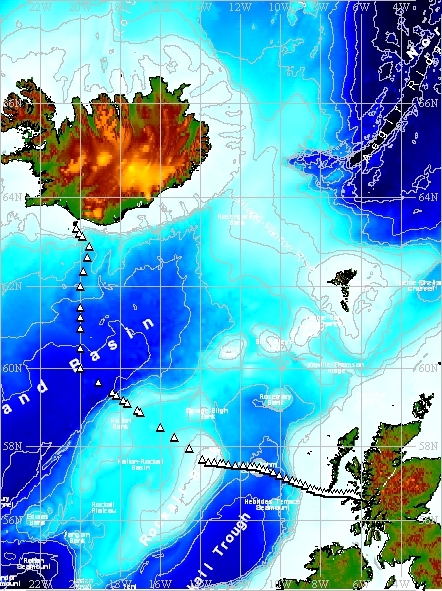 A total of 66 CTD casts were performed during the cruise which sailed between Birkenhead and Falmouth via Rockall, Iceland and Oban incorporating the Extended Ellett Line and Wyville Thomson Ridge. 64 of the casts deployed during the cruise were housed in a stainless steel frame equipped with dual temperature and conductivity sensors. The CTDs were located within and near the bottom of the rosette frame which held 24 10-litre Niskin water sampling bottles. For CD176 the raw .dat and .hdr Sea-Bird files for CTD cast 34 were never supplied to the data originator or to BODC from the ship and should be considered as lost. The salinity and oxygen data from the CTD were calibrated using independent values obtained from the CTD water bottles. The data arrived at BODC in a total of 65 ASCII, WHP (WOCE Hydrographic Program) standard files with 63 of these files representing CTD casts from the stainless steel frame deployed during the cruise. These files contain 2 db-bin averaged data including temperature, salinity and dissolved oxygen channels processed to WOCE standards alongside concurrent fluorometer and transmissometer data.